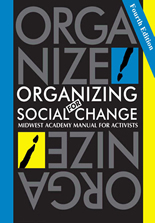 Organizing for Social Change 4th Edition is a comprehensive manual of essential tools for direct action organizing. It provides clear and concise information on the many skills it takes to make social change: recruitment, tactics, public speaking, using the media and building powerful organizations. Learn to think strategically, act effectively and get results! Organizing for Social Change 4th Edition has been an invaluable reference source for countless activists and organizers working for social, environmental and economic justice at the local, state, national and international levels. It includes examples of real-life organizations working on labor issues, the environment, energy, health care, immigration, public campaign financing and more. Whatever the cause, this is the manual which helps organizers ensure that they reach their goals with efficiency and dignity. USE IT AND ORGANIZE! No part of this publication may be reproduced, distributed, or transmitted in any form or by any means, including photocopying, recording, or other electronic or mechanical methods, or by any information storage and retrieval system. Contact Publisher or permissions.